Hainan has set up a pilot area of a national tropical rain forest park, located in the central mountainous terrain of Hainan,coves an area of more than 4,400 square km or about one-seventh of the island's land area. The pilot area will last until 2020 when the national tropical rain forest park will officially be established. The project involves five national nature reserves, three provincial nature reserves, four national forest parks and six provincial forest parks. 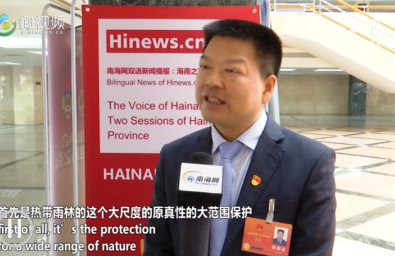 According to Xia Fei, Director of Hainan Provincial Forestry Department, the establishment of the pilot area is to protect the wide range of nature, including Wuzhi Mountain, Diaoluo Mountain, Yinggeling Nature Reserve and Bawangling Nature Reserve. Moreover, it’s the demand for the protection of tropical rare and endangered animals and plants, and also a practice for Hainan to transform green water and green hills into gold and silver mountains, to reach the coexistence of human and nature. "Now we have some cooperation with international organizations and foreign experts in terms of wild animals and plants protection in Hainan, mangrove conservation and surveys for forest resources, so when we launch the pilot area there will be much more international cooperation in the future," Xia told hinews.cn.